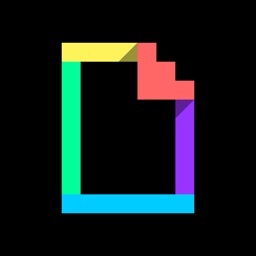 GIPHY: The GIF Search Engine by Giphy, Inc.
Search and send all the GIFs, all the time. There's still some debate as to the proper pronunciation of "GIF." 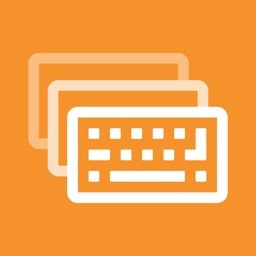 Is the G in the name of the popular image format supposed to be hard or soft? 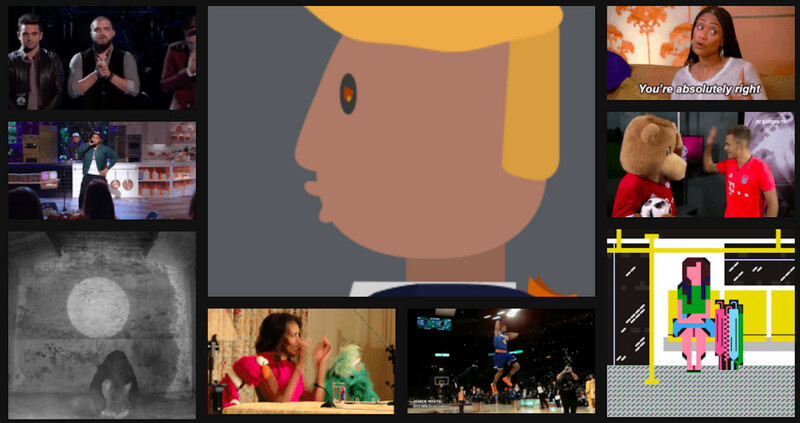 Either way, there's no denying the ubiquity of GIFs, especially animated ones. 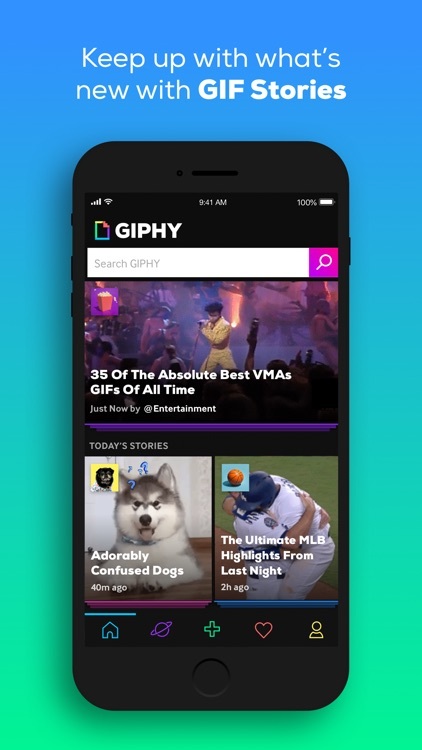 And with Giphy, you can easily put them practically anywhere and everywhere you want. Whether you need them for witty responses or wacky non sequiturs, the right animated GIFs at the right time are within your reach with Giphy. With the app, you get access to a huge catalog of moving images on loop, from those of pop culture icons to those of cats being, well, cats. 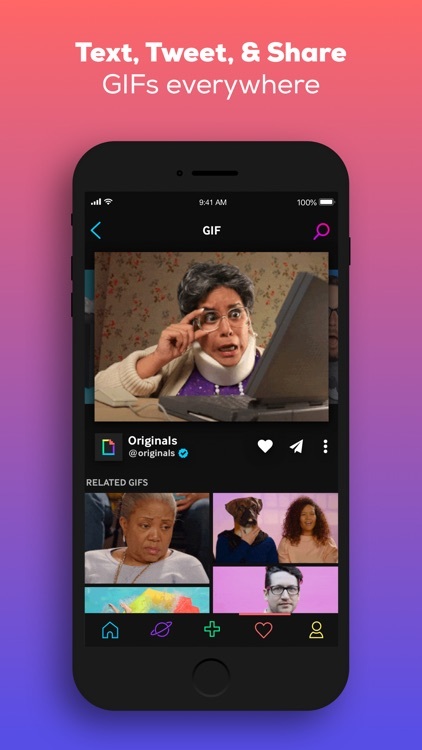 Just browse or search Giphy's collection and you're sure to find GIFs that you can text to friends, share on social media, or save for yourself. you like sending and sharing animated GIFs. you want a much easier way to search GIFs than Google. 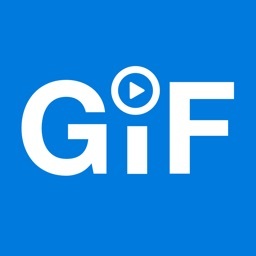 you want to collect your favorite GIFs in one convenient place. you consider the proliferation of animated GIFs the bane of your existence. you would rather static images, thank you very much. 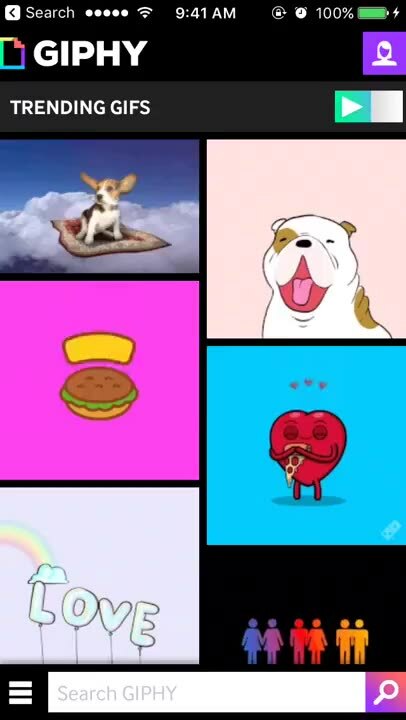 Giphy is touted as the world's largest library of animated GIFs. And you know what? You'd be hard pressed to dispute that. With Giphy, virtually any animated GIF is just a few taps away, ready to be shared in a text or on social media in a -- wait for it -- jiffy. The world’s largest library of animated GIFs and stickers, now on your mobile phone! 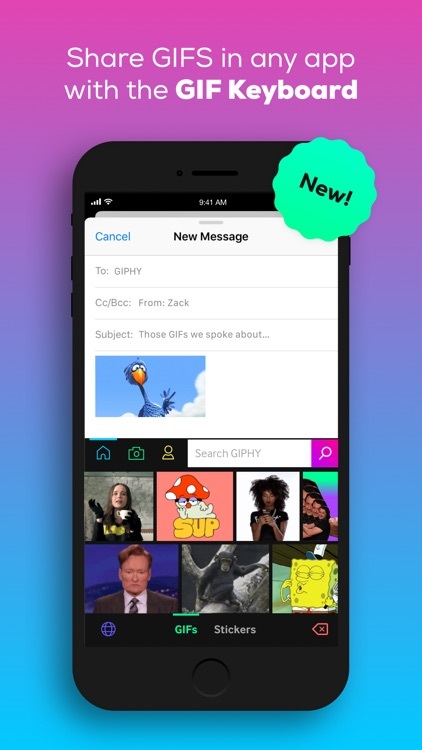 GIPHY for iOS is the fastest, simplest way to search and share GIFs and stickers across all of your favorite social channels such as iMessage,Facebook Messenger and more. Faster than ever, but still wicked easy. Now with an Auto-Play on/off switch for those annoying moments spent on a poor connection to the inter webs, and 3D touch for quick access. 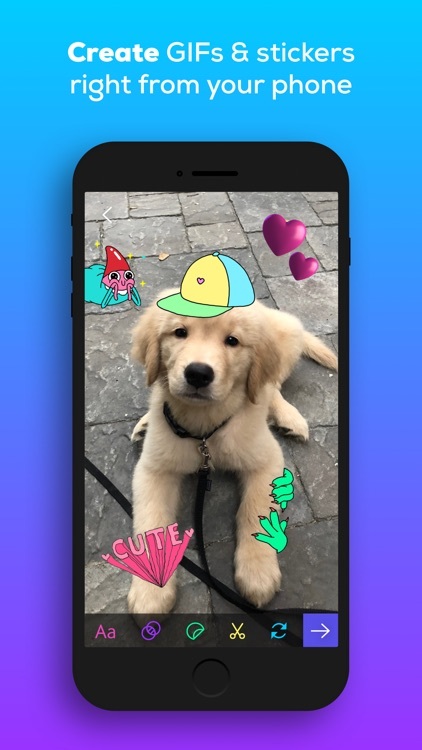 Also, create your own custom content by utilizing our new Sticker Maker (iOS 12 and up) or the built in GIPHY Cam features. 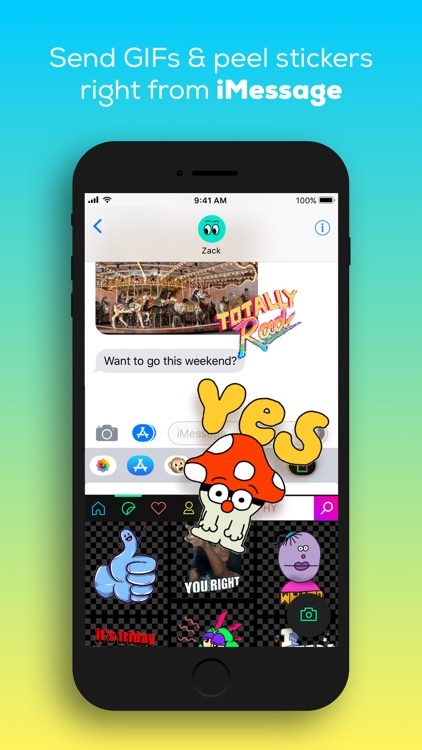 GIPHY is also optimized for iOS, featuring the iMessage Extension (for your texts) as well as the new Keyboard Extension (iOS 11 and up) allowing you to access GIPHY within your keyboard & send GIFs in any app that accepts media (text, email, messengers, social platforms, and more!). • Find the perfect GIF from the world's largest library of animated GIFs! All the power of GIPHY is in your hands. What are you waiting for?! • Text your friends amazing GIFs. • Share a GIF in Facebook Messenger, Instagram, Pinterest, in an Email, tweet it on Twitter, or post it to Facebook. • Copy to clipboard or save it for later on your Camera Roll! • Are text emojis just not cutting it anymore? Need a better way to say LOL? Maybe you just wanna say “thumbs up”, “yes!”, “happy birthday”, or “deal with it”. We've got a GIF for that. 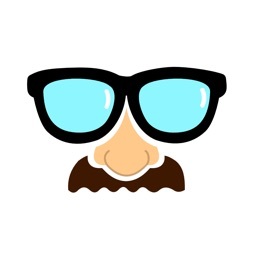 • Static emojis are so old news, share an animated sticker GIF instead! • Do all of the above without ever leaving iMessage! 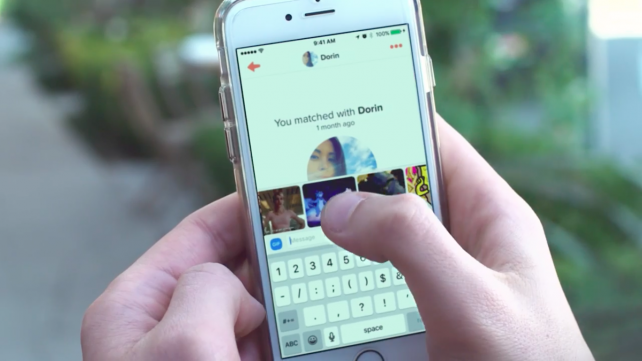 Tinder has just received an update that makes for more "animated" match conversations. 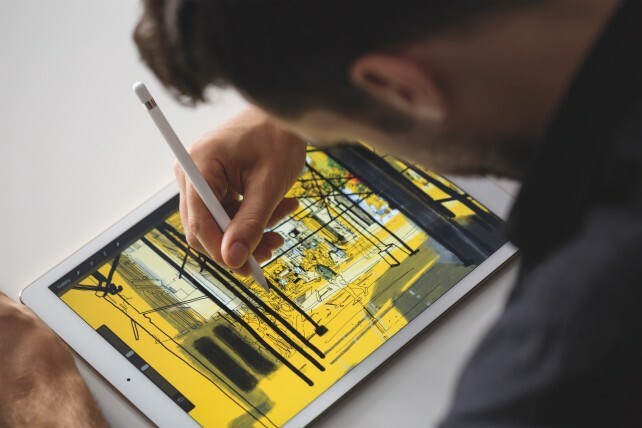 Here are some of the top tech stories this week.